In addition to visualisation, the DEEM tool also allows to download data in CSV format. The DEEM tool users will also get functionality to upload their own GIS data to overlay on top of our data without compromising security as the data remains on user’s browser. Please note that some of the app functionalities of the DEEM tool may not work on mobile or smart devices. For the best performance please access the DEEM tool on a desktop or laptop using the latest browser. Gives a quick overview of the DEEM tool. The bottom summary table summarises DEEM tool data selected by user. Word cloud shows EPC recommendations for the area selected. User can select individual energy efficiency measure and view corresponding postcodes. Upload your own data on top of the DEEM data. Your data remains on your browser and not shared outside. Zoom into level 14 or beyond, so that ‘Draw’ polygon tool is activated. Using the ‘Draw’ tool, draw an area. Once the area is drawn, it can be edited using ‘Edit area’ tool. Click on the tool. This will enable the polygon nodes. Adjust the polygon nodes as required. 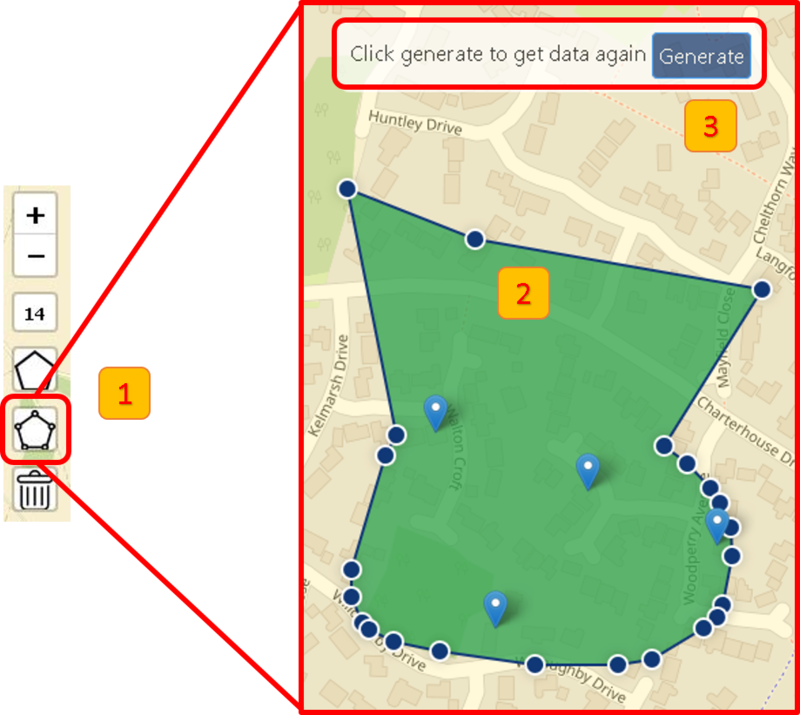 Click the ‘Generate’ button to get data for the new area. UK’s fuel poverty map layer was compiled by combining the latest fuel poverty data available for England, Wales and Scotland. Please refer to FAQ section for individual sources. 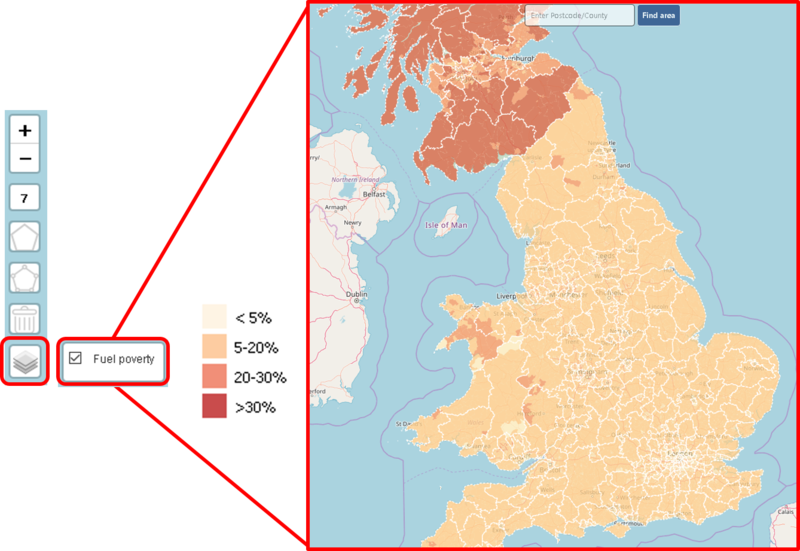 The layer shows four classifications – less than 5% households, 5-20% households, 20-30% households and above 30% households under fuel poverty. The ‘Side bar’ displays results of individual postcodes. 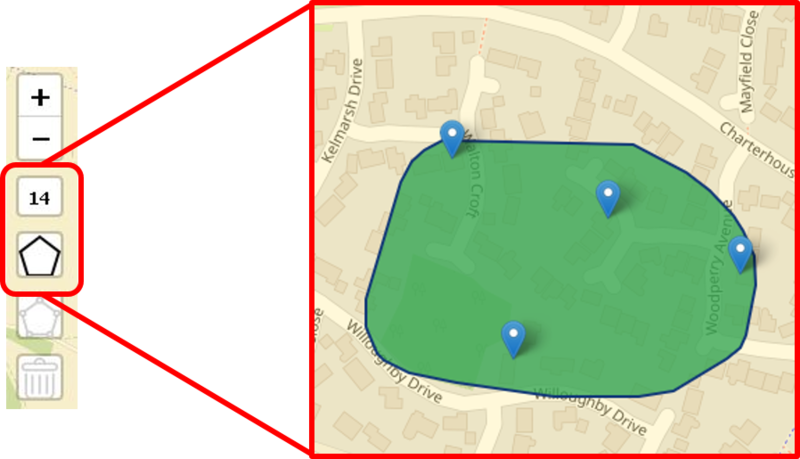 With mouse hover user can see results for each postcode. User can download the visible data by clicking the ‘Export to CSV’ tool on top of right side-pane. A comma separated value file can be opened in a spreadsheet application such as MS Excel, LibreOffice or OpenOffice calc. Upload your own map layers. User can upload up to 2 layers each maximum of 1MB file. 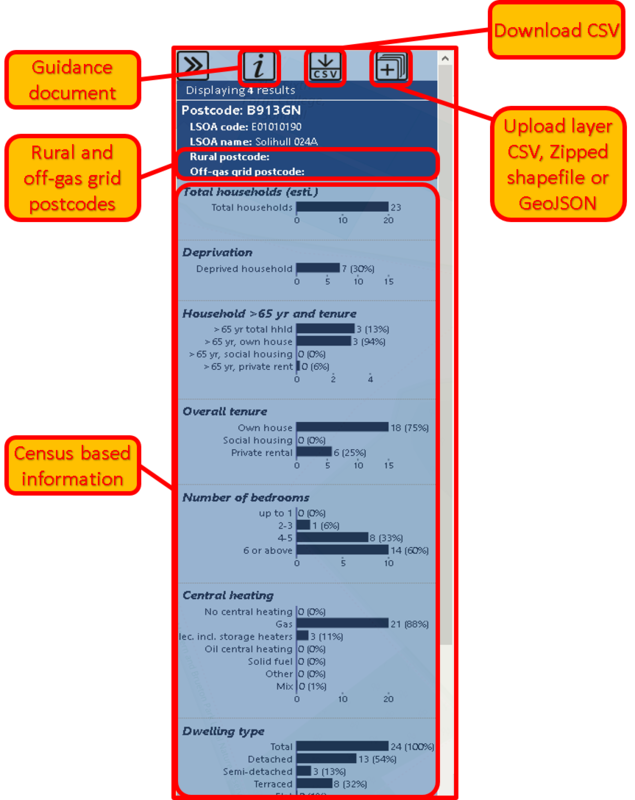 Acceptable data formats are CSV, Zipped shapefile and GeoJSON. The CSV file should have at least 2 columns named – ‘lat’, ‘long’ respectively for latitude and longitude data; and should not have any empty cells. File size for uploading GIS layer is limited to 1MB to ensure the stability of user’s browser. The ‘Bottom bar’ (in green) gives summary of the whole area selected. Select the ‘View Data’ tables from the list to view summarised data in the next section. User can select up to two tables simultaneously. Word cloud shows EPC recommendations for this area by postcode. Select individual recommendation to see respective postcodes on the map. Chart shows total gas and electricity consumption as well as total meters during 2013 and 2015. Stacked columns show total gas and electricity use in thousands over primary axis (on left), whereas secondary axis (on right) gives total gas and electricity meters as line chart. Who developed the DEEM tool? The DEEM tool is designed and developed by Resourcematics. The company is providing specialist technical and advisory services to public and private sector organisations, local authorities, social housing providers and home owners in energy efficiency, legal compliance, site audits and carbon management. Our services include compliance for various government schemes and IT solutions for energy sector. Postcode data was sourced from Ordinance Survey’s Code-Point Open that provides 1.8 million postcode units in England, Scotland and Wales. For England, Sub-regional fuel poverty data of 2016, published in 2018. For England and Wales, EPC data is based on Ministry of Housing, Communities & Local Government. For Scotland, Scottish Government website. In England and Wales, where multiple EPC data is available for a property, the most recent one is considered for the model. Data availability and how can I use? We have developed a model that crunches huge amount of publicly available data at various administrative levels and estimates postcode level information for ECO3. No guarantee is presented or implied as to the accuracy of specific estimates and forecasts contained herein. Users are welcome to use, test and verify our data and information in various regions. Users are encouraged to provide feedback on info@resourcematics.com, how this data are used and how well they meet user needs. If possible, we will be happy to review and incorporate suggestions for upgrading the DEEM tool. Copyleft. No copyright is claimed here.